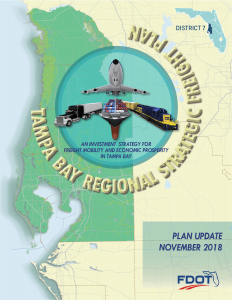 The Tampa Bay Regional Strategic Freight Plan defines an integrated and connected regional freight transportation network and identifies regional freight investment priorities needed to sustain economic growth in the Tampa Bay region. The plan was undertaken in response to steadily increasing emphasis on freight mobility concerns and economic development in recent years. It identifies strategic transportation investments needed for better mobility and accessibility for trucks. It also identifies improvements to address the unique operational characteristics of trucks that can often be implemented at relatively low costs. Additionally, guidance is provided to assist planners and engineers to define and develop freight improvement strategies that are appropriate given the freight corridor function, the land uses and activities within the corridor, and the shared uses of the corridor.